Cold soups are perfect for summer. They are refreshingly light and often made from healthy ingredients. As summer comes to an end, make cold soups with the end of the season’s harvest. This way, you use every bit of the great fresh ingredients summer offers, such as squash and tomatoes. If you have extra, you could always freeze it for the fall. Here are just some of the summer ingredients you can use to make delicious cold soups, before you only want the hot variety. Watermelon may epitomize summer, with seed spitting contests and fresh watermelon popsicles. You can use watermelon to make a delicious cold soup that is refreshing and as light as the fresh fruit itself. Just like the popsicle recipe, you can blend watermelon, mint, and honey into a blender until it is smooth. For added flavor, add fresh lemon juice. Serve cold in bowls, unless you serve it in a hollowed out watermelon. 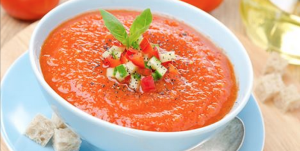 Many cold soups utilize tomato bases for decadent flavors without adding many calories to a soup. Mix fresh and ripe tomatoes, diced, with minced garlic cloves, salt, olive oil, and vinegar to make gazpacho. In a food processor, mixing all of these ingredients is a quick task. Then store the soup in the fridge for an hour in a nonreactive bowl. In order to make a delicious cold soup from zucchini, you will need to cook it with the other ingredients first. Start with some olive oil in a pan. Add zucchini, shallots, and onion. Season as you wish. Then, add low-sodium broth. Allow mixture to cool down before blending in a blender. For a creamier soup, add buttermilk or low-fat Greek yogurt. Borscht is probably one of the most famous summer soups made from fresh beets. Eastern European in origin, the soup can easily elevate your summer dinner menu. Boil fresh beets without the green tops for 40 minutes in a large pot of water. Once cooked, you can blend the beat mixture with sour cream, vegetable stock, lemon juice, or yogurt. If you want additional recipes or tips to make your life healthier, check out our website where you’ll find our blog and database of healthy recipes.